Nancy Lewis concentrates her practice on complex commercial insurance coverage litigation, civil appeals, and post-trial motions that seek to adjust and/or set aside a jury's verdict, thereby obviating the need to pursue an appeal. She also provides coverage opinions and litigates coverage disputes. 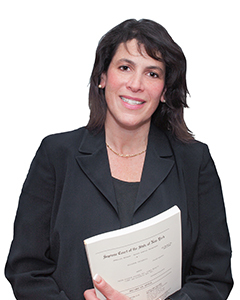 In addition to writing appeals and supervising the work product of the firm's other appellate attorneys, Nancy provides evaluations to clients regarding the "appealworthiness" of Orders or Judgments from within the firm and from other firms. Each evaluation involves engaging in a critical review of the Record or Trial Transcript for identification of appealable issues, determining the probability of success, and then making a well-considered recommendation to the client as to whether an appeal is warranted in light of the costs involved. In addition to the care with which she evaluates "appealworthiness", Nancy has become known for her effective, persuasive oral arguments. In every area of her practice, Nancy, a natural competitor, takes tremendous pride in her work, in out-witting her opponents, and in achieving the best possible results for the firm's clients. Connecticut 1995 New York 1994 U.S.D.C. E.D.N.Y. U.S.D.C. of Connecticut U.S.D.C. S.D.N.Y.